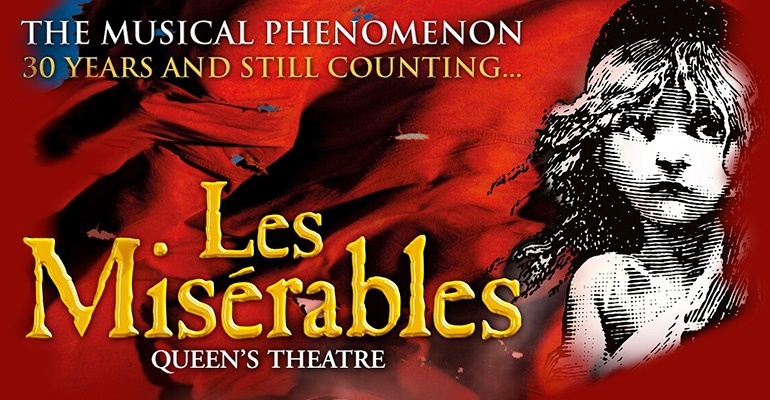 London's production of Les Misérables is the world's second longest running musical and has been performed to over 60 million people worldwide. Telling a complex tale of love, honour and rebellion in early 19th Century France, Les Misérables focuses the French peasant Jean Valjean, who has spent nearly 20 years in jail for stealing a loaf of bread. When he breaks his parole to start his life afresh, Javert, a police inspector, mercilessly tracks him on a perilous journey through France. But Valjean is determined to redeem himself and re-join society. He eventually becomes a successful Mayor and factory owner. There, he meets the destitute Fantine, and promises to care for her daughter Cosette as her dying wish. This decision changes both Valjean and Cosette’s lives forever, but Javert is always hot on their trail. Told through heart-wrenching songs, Les Misérables features well-known numbers such as "One Day More", "Do You Hear the People Sing", "On My Own" and "I Dreamed a Dream". Les Misérables is suitable for children over 7, but contains violence and sexually suggestive scenes. Under 5's will not be admitted. Les Mis is easily the best musical I've ever seen. I've always wanted to see it and finally got to go for my birthday. Incredible music, world class singing and wonderful acting performances. Loved every second of it and wish I could go again! I took my mum to see Les Mis for her 90th birthday and it was such a special treat. The staff were incredible, I mentioned to them that it was mum's birthday and they made such a fuss of her. It was lovely to see her so happy on her birthday! I didn't buy a special package ticket, I know you can get some with champagne, but they showed us to our seats and made sure that mum was comfortable and explained the hearing aid facilities to her. It was amazing service! The show itself was obviously wonderful and it was amazing to finally see it live. What an unforgettable experience and a memory that I will cherish forever. Thank you Les Mis! Les Miserables really is a special show. I've seen it three times now since it opened and it's always magical! I think a lot of West End shows that have been going for a while have lost their momentum and feel a little dated, but not Les Miz. It still has that original energy. It's definitely a life experience, save up and go!